Kumbhakonam and the surrounding villages are linked together through via a wondrous story regarding this particular cycle of creation. During the cosmic deluge of pralaya, Brahma prepared himself for the next cycle of creation. He put all the seeds from which creation would sprout in amrita [the elixir of immortality] and kept them together in a clay pot. On top of the pot, he placed a coconut with mango leaves and wrapping around the pot’s neck a sacred thread. He then placed the pot on the peak of Mount Meru in the Himalayas. With the cosmic deluge, the pot came floating down from Mount Meru as per Brahma’s plan. Ten kilometres from Kumbhakonam, the coconut was dislodged and fell into the water. Instantly the waters cleared there, revealing land. To this day the God worshipped there is Narikel Isvara [narikela means “coconut”]. Then, the sacred thread [sutra] unravelled from the pot and fell off. The deity in the place where the sutra fell is called Sutra Natha—Lord of the Thread. Brahma watched all these events transpire. There was only one problem. The pot with the amrita and seeds of creation had failed to overturn in the flood. Brahma then fired off an arrow, breaking the pot. The place where Brahma shot the arrow used to be called Banapuri [“City of the Arrow”] and today it is known as Vanattirai. 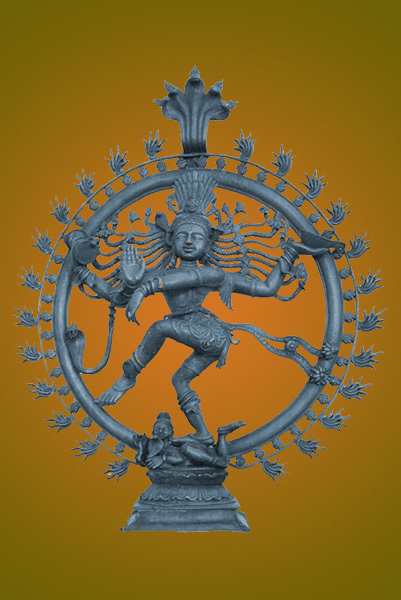 The deity worshipped there is called Banapur Isvara. The kumbha [pot] which held the amrita and seeds had both a “nose” as well as a “mouth.” In such a pot, water is poured in through the “mouth” and out through the “nose.” The spot where the mouth of the pot broke is called Kudavayil [now known as Kudavasal]. It is 20 km southeast of Kumbhakonam. 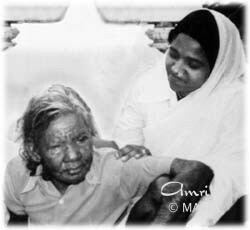 Brahma wanted the amrita to be discharged from the kindi in a proper manner. According to the scriptures it should come through the kindi’s nose. And this is what happened. 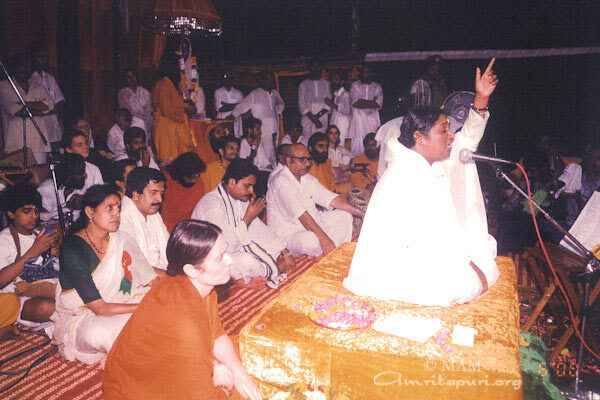 And the place where the nose broke and the amrita fell is the most holy of all these places. It is called Kumbhakonam [kon (konam) meaning “nose.”] Here, the clay pot itself came to be the linga; even today is like that. Kumbha Isvara is the name of the god in the temple. 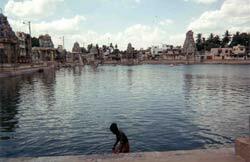 The maha-maham bathing tank there—which covers an area of 6.2 acres and has a depth of 10 feet—is said to be the spot where the amrita fell. Every 12 years there is a nine-day Kumbha Mela, wherein millions of people come to bathe in these waters as a rite of purification. 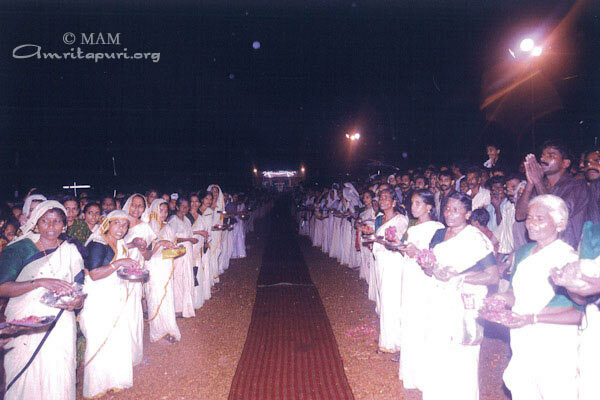 After the darshan, when Amma was going up to Her room, all the devotees gathered around the foot of the stairs leading to Her room and started crying out to Her. “Amma! Amma! 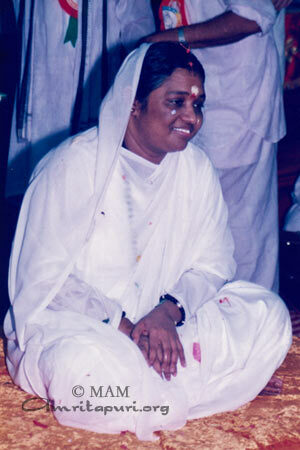 Amma!” was the one spontaneous cry that rose from the hearts of all Her children. It was a sight to behold! The thought that their beloved Amma was going to leave them after those five blissful days in Mumbai was too much to bear. 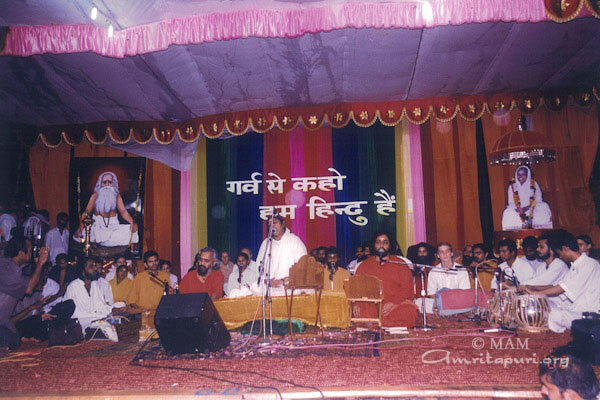 All the devotees started crying. 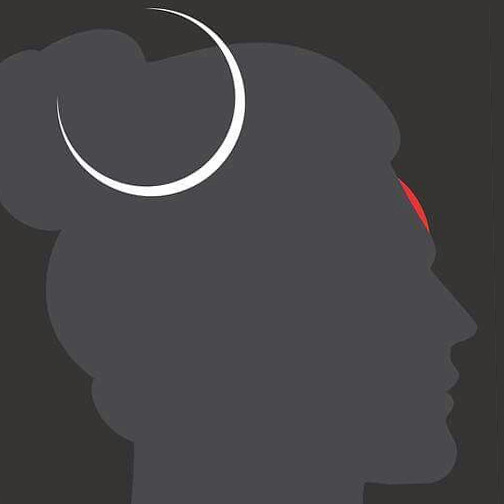 From where She was standing, Amma gazed at them with deep compassion, a smile on Her lips, the red kumkum mark of Her Devi bhava still adorning Her forehead. 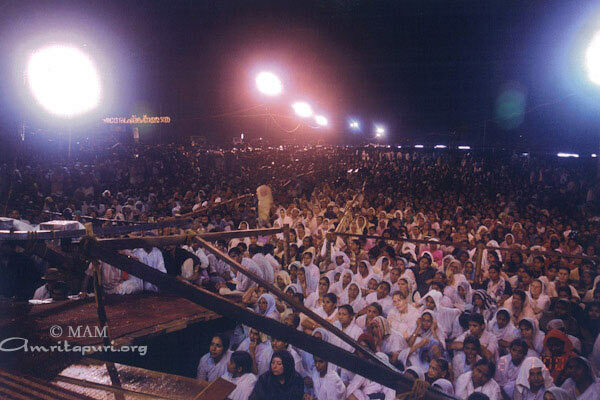 The whole atmosphere was charged with love and devotion. 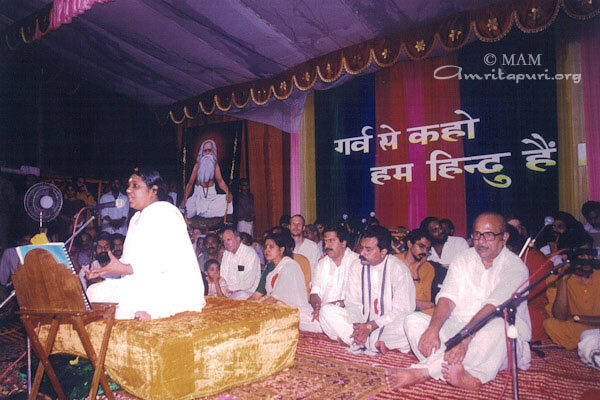 All eyes were on Amma as Her gaze moved over each and every person gathered there. One lady spontaneously burst into song, “Asu Bhare Nayanom Se” The soulful melody of the bhajan and the lyrics were especially poignant. “O Radhe Shyam, why did you leave us and go away? “He left without saying a word, neither did He leave us a message of consolation, nor did He look back even once. 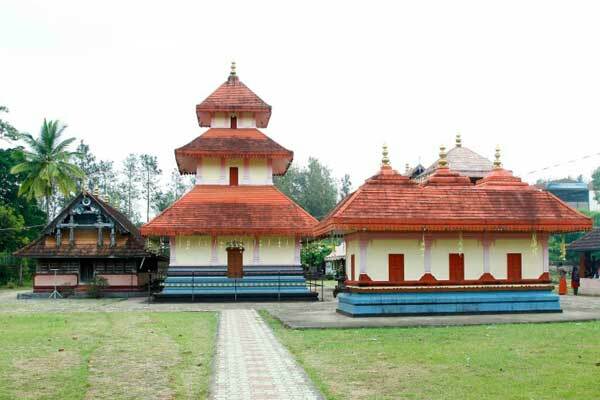 The main temple of Tiruvanantapuram is the Padmanabha4 Swami Temple, which is located in an area known as Anantankad: “The Endless Forest.” The story behind the origin of this temple and Tiruvanantapuram’s eternal connection with Lord Vishnu is revealed through several legends. In fact, the city is mentioned in five Maha-Puranas—Padma, Skanda, Vayu, Varaha and Brahmanda. In Brahmanda Purana, an entire chapter is dedicated to “Anantapura Mahatmyam” [the Glory of Ananta Puri]. 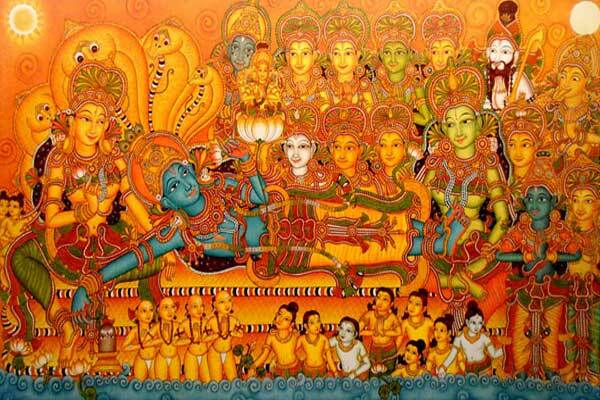 In the Srimad Bhagavatam, Balarama, Krishna’s brother, is said to have visited the Padmanabha Swami Temple. The temple is considered to be one of the 108 Divya Ksetrams of Lord Vishnu. It is also mentioned in the Mahabharata. According to the puranas, the temple was set up by a Tulu Brahmin ascetic named Divakara Muni on the 950th day of the Kali Yuga5. Divakara Muni, a great devotee of Lord Vishnu, was performing tapas [austerities] in a forest. One day, the Lord appeared before him in the form of a beautiful child of unearthly charms. The muni immediately fell in love with the child. He took the boy in his arms and caressed him like a mother. The child was very affectionate to the muni as well. He requested the boy to stay with him. The child agreed with one condition: the muni should never get upset with him. The muni agreed, and for years he raised the boy with the fondness of a mother, all the time tolerating the child’s mischief. There is another version of this story. In it, Vilvamangala Swami, a devotee of Lord Krishna, was absorbed in meditation when a small boy came and scattered his objects of worship. Before he could scold the boy, the boy disappeared. 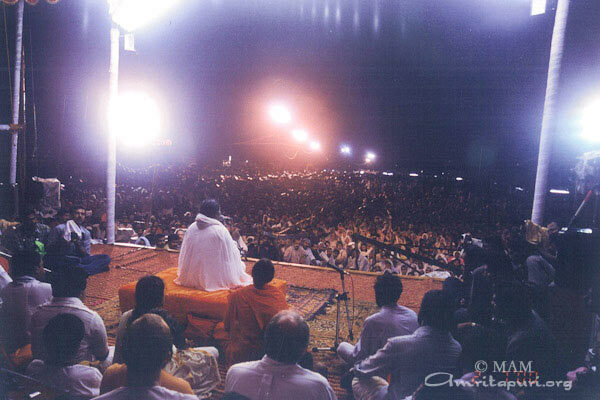 Swallowing his anger, the swami returned to his meditation. But once again he was jarred from his concentration by the sound of his puja articles being scattered. This time, without even opening his eyes, he slapped the child. Immediately the child responded, “I will not see you hereafter. If you want you can see me only in the forest of Ananta.” The swami then realized that the boy was none other than Sri Krishna. 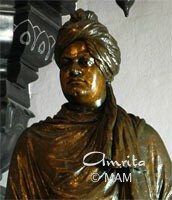 Like Divakara Muni, Vilvamangala Swami was inconsolable and searched day and night for the child. During his search, he overheard an angry mother telling her son that she would “throw him into the ‘Anantankad’ if he continued to be naughty.” The swami immediately asked the mother where this Anantankad was. She directed him, and he ran to the spot. When the swami neared the location of the present Padmanabha Swami Temple, he heard a tree crashing to the ground. On reaching the spot, he found Lord Vishnu lying on Ananta Shesha. According to the story, he also requested the Lord to reduce himself to a worshipable size. It is interesting to note that the idol in the Padmanabha Swami Temple is so large that in order to see all of it, one must look at it through three doors. It is said that the original idol was the very same wood from the fallen tree. This was worshipped for thousands of years until it the temple, and idol, were renovated in 1729 ACE. The final story of the temple’s origin says that it area was an ancient forest. In that forest, a pulaya7 woman harvesting crops suddenly heard the crying of a baby. She searched for the source of the sound, and soon found a child with a divine appearance. She considered the child so holy, that she decided to bathe before even touching it. She then began to suckle it as if it were her own. She then left it under the shade of a green tree for some time in order to finish her day’s work. When she came back, she could not believe her eyes—a massive five-headed serpent was sheltering the baby with its five enflamed hoods. The woman related the tale to others, and soon it reached the ears of the Raja of Travancore, who ordered a temple be built on the spot. 2 The Sanskrit word “shesha” literally means “that which remains.” The idea is that Ananta Shesha continues to exist even at the end of a cycle of creation. He is considered as an extension of Lord Vishnu himself. 3 The image of Lord Vishnu reclining on Ananta Shesha is symbolic of yoga nidra, awareness even during the period of pralaya [cosmic dissolution], after a cycle of creation has come to an end and before another has begun. 4 Padma-nambha means “lotus-naveled one.” Lord Vishnu is called this, as he is often depicted with a lotus flower growing out of his belly button. In Vaishnavite tales—wherein Vishnu is seen as the Supreme God and all other gods as his subsidiaries—Lord Vishnu is not only the Preserver, but also the Creator and Destructor. As such, Lord Brahma, who is typically considered the Creator, is presented as coming out of his navel on top of a lotus flower. 5 According to astrological references based on star positions, many authorities believe Kali Yuga to have begun in 3102 BCE. Therefore, the temple would have been begun in 3099 BCE. 6 Salagrama are black stones found in the Gandaki River in which fossil ammonites are embedded, leaving markings like a discus. They are worshipped as abstract representations of Lord Vishnu. 7 Pulaya indicates a working class agricultural woman. Mysore is really named after a demon—Mahisha Asura. Originally, the city was known as “Mahishuru,” which means “Mahisha’s City.” Gradually, it came to be called Mysuru, which was later Anglicized to Mysore. Mahisha is Sanskrit for “buffalo” and an asura is a type of demon. 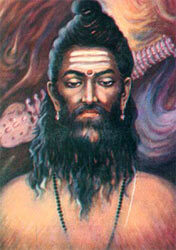 Mahisha Asura was a demon who could switch back and forth between human and buffalo form. It is said that he was the son of an asura king named Rambha who consummated his love with a buffalo. 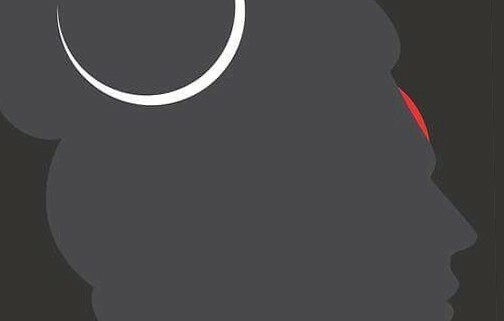 The resulting child, Mahisha Asura, was a changeling who could shape-shift from human to buffalo and back again, as well as into other bestial forms. 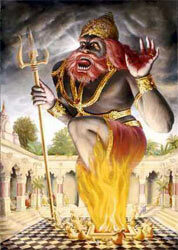 He terrorized the devas [demigods], and thus they pleaded with the trimurti of Brahma, Vishnu and Shiva to help them. Because Mahisasura was blessed with a boon that prevented him from being killed by a man, Devi came forth to set thing right. In fact, Mahisha was so overwhelmed with Devi’s beauty that he wanted to marry her, but Devi was not interested. She only wanted his blood in battle. Armed with the weaponry of the trimurti and riding a lion, Devi single-handedly destroyed all of Mahisha Asura’s minions and finally, after an epic battle, cut off his head. According to legend, Mysore was the city of Mahisha Asura, and it was near the top of a 1,000-metre hill here called Chamundi, that Devi slew him. Thus Devi gets names like Mahisha Asura Mardini [The Slayer of Mahisha Asura] and Chamunda Isvari [The Goddess of Chamunda]. 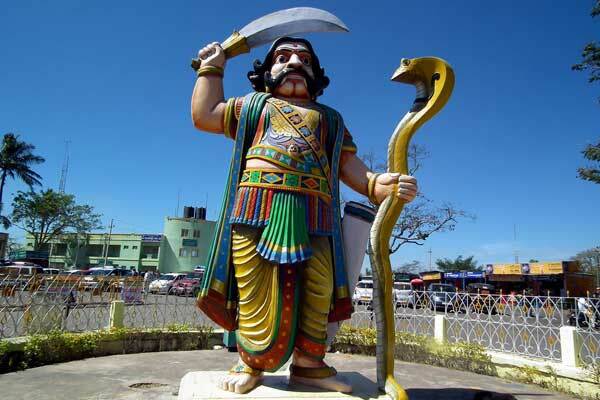 If one climbs the 1,000 steps to the top of Chamundi Hill, one will find not only the Chamundeswari Temple, but also a massive statue of Mahisha Asura—with a snake in one hand and a dagger in the other. At the 800th step, there is also a 15-foot high and 24-foot long granite statue of Nandi, the devoted bull ridden by Lord Shiva. Once upon a time, Lord Brahma was flying through his creation on his swan. At one point he was drawn by the beauty of a hill in what is today known as the Wayanad District of Kerala and decided to land there. (Thus the hill received it name “Brahmagiri.”) As he walked down the slope, he became exhilarated by the intoxicating fragrances, sounds and colours of the forest. Suddenly, in the middle of one particularly beautiful riverside grove, he saw a stunning, jewel-bedecked, idol of a four-armed god resting in a nelli tree (Amla Tree, Phyllanthus emblic). But as soon as Brahma saw the idol, it disappeared. Overwhelmed by a combination of grief and shock, Brahma immersed himself in deep contemplation in order to get the vision once again. During that contemplation, Brahma realized that the idol was that of Lord Vishnu and the area he was strolling through verily Vishnu Loka. At this point, a disembodied voice confirmed his insight. “The image thou hast seen is that of Vishnu. The excellence of this area draws and keeps him here,” it said. The voice told Brahma to install the idol, and Brahma did so, calling it Sahyamalaka Kshetra. In fact, there is an unpaved area within the temple where Brahma is said to have conducted the temple consecration rites. To this day, the Brahmin priests who run the temple set up all the puja items afresh at night, so that Brahma can come down and perform his worship each night. Tirunelli is located about 30 kilometres to the northeast of Manantavadi, where Amma has an ashram and Brahmasthanam Temple. According to the legend, Sita used pul [grass] taken from here for palli-kolluka [taking rest] during the time when she was sent away from the palace of Lord Rama. Thus Pulpalli gets its name. The primary deity of the Pulpalli temple is Sita Devi, which is quite rare. It is believed that Sage Valmiki, the author of the Ramayana, lived southwest of Pulpalli at Ashrama Kolli 1, and that Sita was staying there during her period of exile. The Sita Devi idol at Pulpalli is known as “Jadayatha Amma,”or “The Mother Who Lost Her Matted Lock.” The story goes that Sita was so aggrieved that Rama had sent her to the forest that she prayed to her mother, Bhumi Devi [Mother Earth].2When she prayed thus, the earth split in half and she entered inside. The only trace of her left behind was one matted lock lying on the ground. It is said that the tears that fell from Sita at that time formed a river—Kannaram Puzha. Furthermore, although Wayanad is famous for its leeches, there are none in Pulpalli. The belief is that this is due to the purity of Sita Devi’s tears. Another interesting fact about Wayanad is that it is the only district in Kerala where the Jain religion still has a presence. The Jains came over the hills to Wayanad from Karnataka in 12th century to escape persecution at the hand of Muslim kings. 1 There is a group in Wayanad District that is working to reconstruct Valmiki’s ashram and temple on its original site. 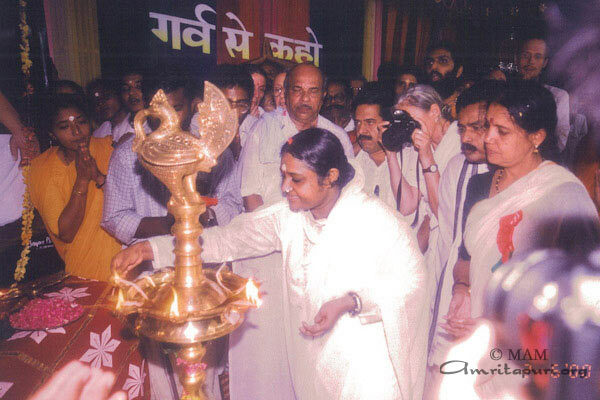 In the early 1990s, at the group’s request, Amma laid the foundation stone for this construction. 2 As a baby, Sita was found by farmers while they plowed a field in the kingdom of Janaka. Thus she was considered Bhumi Devi’s daughter. 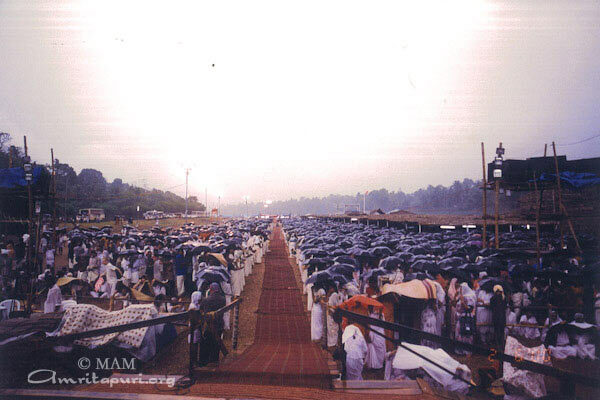 Usually when Amma is about to arrive at one of these big outdoor programs, all faces are turned towards the far end of the center aisle of whatever huge space or pandal has been arranged. Music is playing, and a long carpet has been rolled out for her to walk along, greeting her thousands of children. When she reaches the stage, she’ll mount the few steps, then step onto her peethom, and greet the crowd, hands above her head, saluting the divinity within each of them, all of them. This is how it was yesterday in Cherukolpuzha, except for two small details: the peethom wasn’t in place. Nor was the brilliant gold-coloured carpet. They had been, but suddenly, just few hours before Amma was due to arrive the rain started. Not one of those soft, cooling, refreshing brief sprinkles one expects in this non-monsoon season. No: it was a complete and drenching downpour! 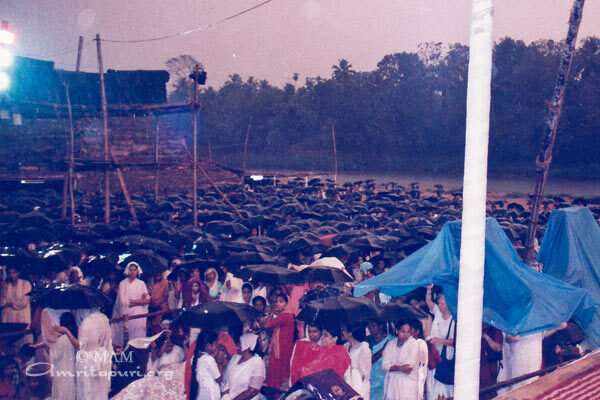 Out in the crowd, umbrellas opened, sitting mats and plastic chairs were raised over heads, even the huge blue plastic tarp the ashramites would normally be sitting on was instead lifted high over their heads, arms acting as tent poles! And the carpet and the peethom–where were they? 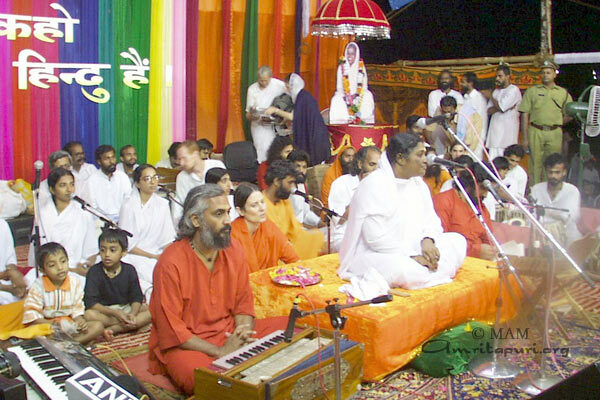 The carpet had been rolled up and stashed away; the peethom had been moved further back on the partially-covered stage to be sheltered–after all, Amma would sit on it for at least 6-8 hours this night, first for the formalities of the program, then for her satsang, and bhajans–and then, her trademark: darshan. 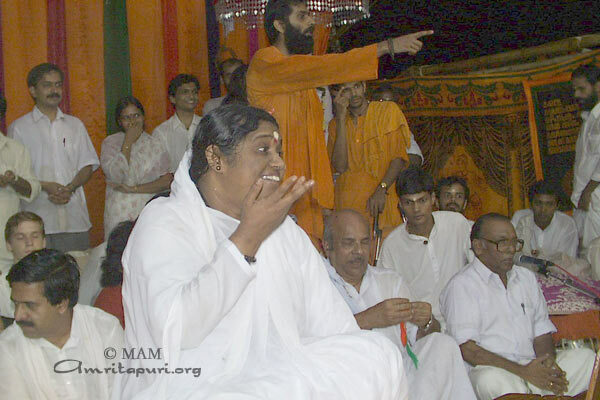 Nobody wanted Amma sitting on a wet peethom for any time at all, never mind many hours! ‘Maybe she wouldn’t even come–this was an outdoor program, with little or no shelter either for people on the stage or for the crowd of thousands. Maybe it would just be cancelled’, thoughts flashed through many minds. 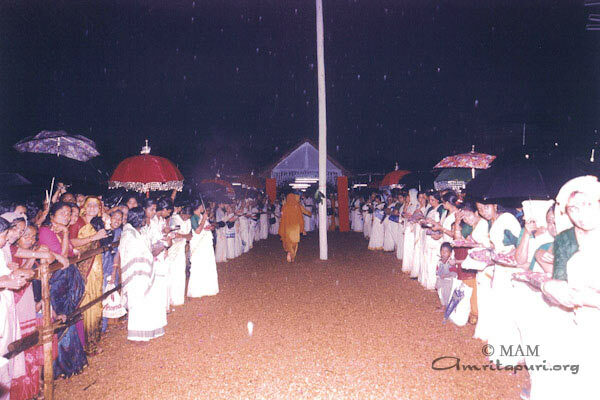 But Amma arrived during the downpour, and sheltered by their own ingeniousness or not at all, the people crowded to the edge of the center aisle to watch her walk the distance–not on a golden carpet but on a jute runner–smiling, greeting, as always. Of course, she had an umbrella–but then, she always does: the ceremonial one that is always carried, rain or shine, when a person of her stature is formally processing. This time, however, from its red surfaces and golden tassels, water cascaded down–maybe tirtha for those it fell on. 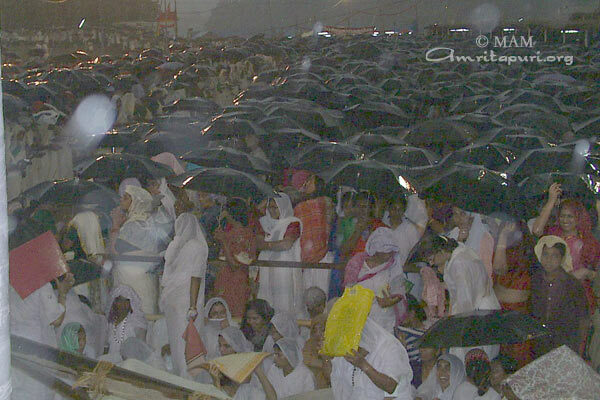 By the time Amma reached the stage, the rain had begun to let up a bit. She turned, wiping water from her face, and greeted her children out there in the rain. She prostrated, and sat, quietly radiating peace, oblivious to the white flower petal the rain had plastered to her cheek. The formalities could be performed more or less normally. 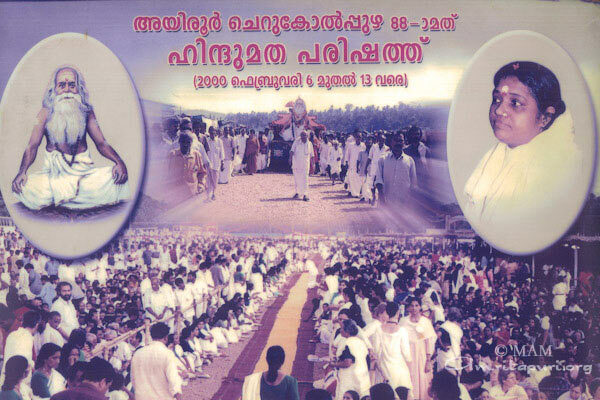 Amma greeted the guests on the stage, and listened whiile dignataries spoke, and then she lit a lamp to inaugurate the conference – the 88th Ayroor-Cherukolpuzha Hindumatha Maha Sammelan. 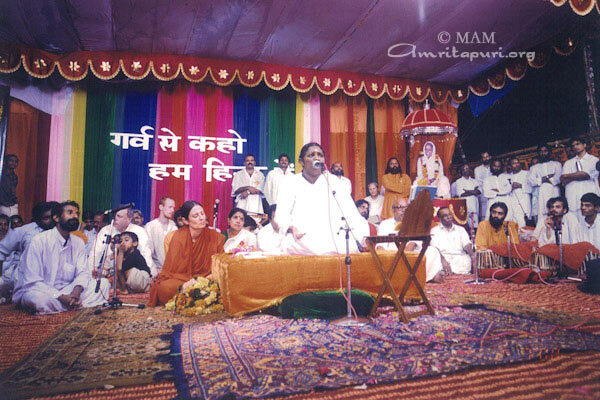 The rain actually stopped during Amma’s satsang, but came back in force during bhajans; both went on “as usual”–rain or no rain, Amma simply does what she does. 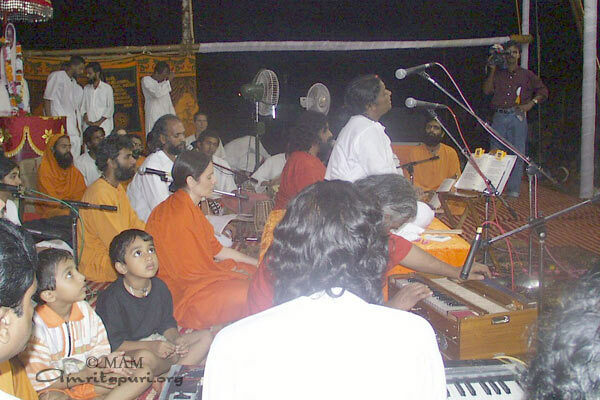 Because the stage roof was leaking the musicians had to move around the harmonium and tabla several times !! 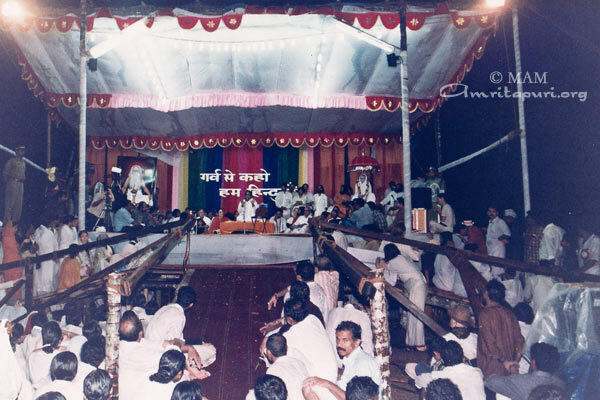 Next would come darshan–for how ever many hours it might take for the thousands who wanted the embrace of the Divine Mother–for the crowd was still huge; the devotees, too, had not been discouraged by the rain. 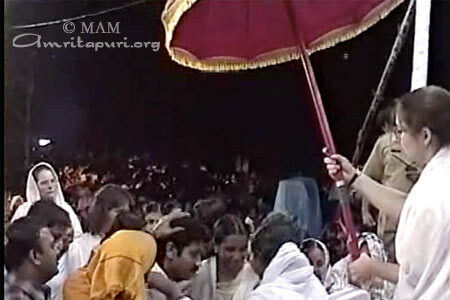 To give darshan, Amma would sit right at the edge of the stage–would the rain stop? No. 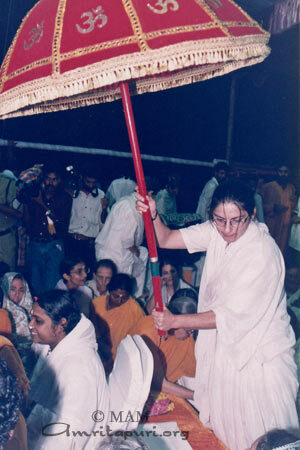 And of course Amma didn’t stop either; she went right on hugging, and someone raised the ceremonial umbrella over her head. Not for long! When she saw this “partiality” (for after all, her children were not sheltered as they stood in the long queue to approach her) she waved away the umbrella. 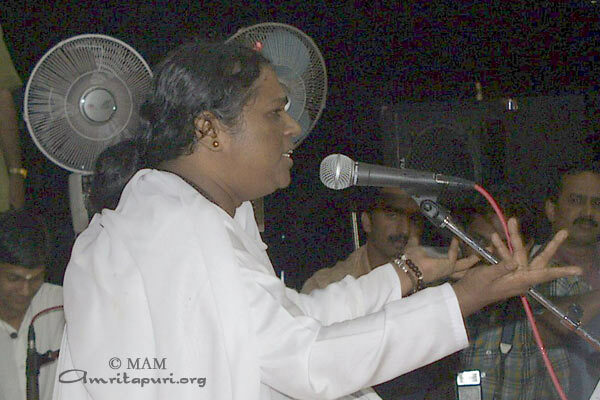 A woman behind Amma reached forward to lift Amma’s sari to cover her head–surely that would be acceptable! Not for long! 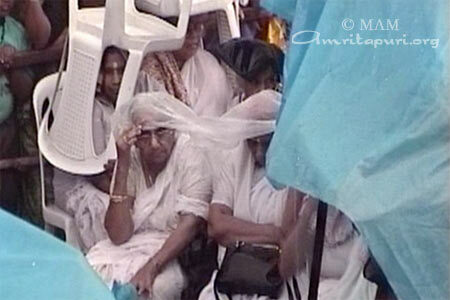 In less than a minute, Amma had pushed the rain-gear-sari from her hair, and was joining her devotees in getting drenched. 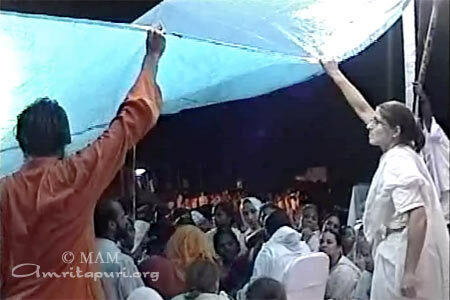 It was only when some brahmacharis and volunteers began raising a blue plastic tarp to protect not only Amma but everyone near the stage, that she agreed to be shielded from the rain. And even then, always the concerned and watchful mother, she was multi-tasking: the hugs went on, the murmurs, the listenings, the connection with eyes—and at the same time she was watching the raising of the tarp, and more than watching: directing! One begins to understand the many arms and hands of the Hindu deities. This mahatma really is like a mother, forgetting herself, concentrating on the needs of her children; spending herself without counting the cost–for us, who so often are…not like that. Sivaratri, dedicated to Lord Shiva, is celebrated on the moonless night of the month of Phalguna, which is the fourteenth day in the krishnapaksha or dark half. Owing to a special planetary conjunction, spiritual practices done on this day are considered to be especially auspicious and beneficial. There is a reference to this in one of the Puranas, where Shiva himself tells Parvati Devi [the Divine Mother] that this day is particularly dear to him, and that those who perform the prescribed austerities on this day will be freed from all sins. One popular story from the Puranas goes like this: There was once a poor hunter from Varanasi. His name was Suswara. He lived with his wife and child in a small hut. Theirs was a hand-to-mouth existence. Suswara would go to the forest and hunt whatever game came his way, and thus feed his family. One particular day, he caught many small animals and birds, which he put into a sack. Encouraged by the catch, he wandered deeper into the forest in search of more game. Soon darkness set in and he turned to go home. He was a little worried as the forest was infested with dangerous animals. He did not like the idea of spending the night there. Soon it became very dark. Unable to find his way back, Suswara climbed a tree to be safe from the wild animals. Attracted by his scent, animals came lurking under the tree. Hoping to scare them away, Suswara plucked some twigs from the tree and threw them at the animals, but to no avail. Throughout the night the animals kept prowling beneath the tree. Suswara was unable to get even a wink of sleep. He kept vigil throughout the night. He plucked leaves from the tree, which happened to be a bilva tree, and dropped them on the ground. Unknown to Suswara, there was a Shivalinga at the foot of the tree; and so, although he was unaware of it, by dropping the sacred bilva leaves, Suswara was making a sacred offering to the Shivalinga. That night happened to be Shivaratri. So the hunter had unknowingly kept a night-long vigil and worshipped Shiva. According to the Shiva Purana, the Mahashivaratri worship should incorporate six items: offering bilva leaves to the deity after giving it a ceremonial bath, which represents purification of the soul; applying vermilion paste on the linga after bathing it, which represents virtue; offering food, which is conducive to longevity and the gratification of desires; lighting incense, which yields wealth; lighting an oil lamp, which signifies the attainment of knowledge; and offering betel leaves, which marks satisfaction with worldly pleasures. These six items form an indispensable part of the Mahashivaratri worship, be it a simple ceremony at home or grand temple worship. The story above is an allegory. Just as the hunter sought to kill wild animals, the spiritual seeker tries to overcome lust, anger, greed, infatuation, jealousy and hatred. The jungle is the mind where all these negativities roam about. A spiritual aspirant must kill these “animals” to be free. The name of the hunter was Suswara, which means “one of melodious voice”. This indicates the purity of intent and speech, which, in turn, imply a level of mental purity. The hunter was born in Varanasi. Vara refers to the forehead while nasi is the nose. The point where both meet is Varanasi, in other words, the point midway between the eyebrows. This point is also called the ajna chakra and is regarded as a nexus of the three nadis: ida, pingala and sushumna. A spiritual aspirant who concentrates his or her mind on this point gains concentration and gradual control over his senses. The killing of the animals thus indicates control over one’s vasanas [latent tendencies]. The bilva tree corresponds to the spinal column. The tree’s leaves are special: each stalk has three leaflets. The three leaflets represent the three nadis mentioned above. The climbing of the tree represents the ascent of the kundalini shakti from the muladhara to the ajna chakra. Keeping awake is symbolic of the kind of awareness and oneness of purpose that a spiritual aspirant needs to reach the goal. He cannot afford to be slack even for a moment. Shiva is the Supreme Consciousness that illuminates the three states of waking, dreaming and deep sleep. Offering the threefold bilva leaves to the Shivalinga heralds the return to a level of consciousness beyond the three states, which is the fourth state, turiya. The dawning of that state is consonant with the awakening of the individual.